Take advantage of Camco Acura’s comprehensive range of services in a welcoming environment – all with a smile. At Camco Acura, we will treat your vehicle with professional care. For over 25 years, we have offered our clients everything they need to keep their Acura in the best mechanical and aesthetic condition. Our service advisors will thoroughly explain all maintenance and repairs your vehicle requires. Our team of expert service advisors will only recommend the necessary repairs and service, while our trained and certified technicians will take care of your vehicle as if it belonged to them. Camco Acura is also the perfect destination if you are in need of quality Genuine Acura parts and accessories. Moreover, our collision centre and detailing department will make sure your Acura looks better than ever by taking advantage of our wide range of cleaning and body repair options. While you wait for your vehicle, relax in our modern waiting lounge complete with Wi-Fi and complimentary beverages. Also, book your appointment with one of our service departments online. 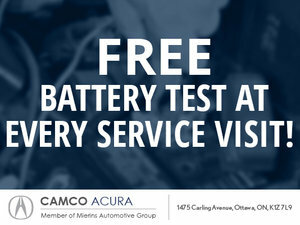 To learn more about our various services, contact Camco Acura today at 1 855 296-2930.